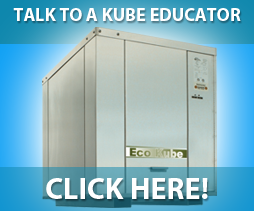 Sustainability has been defined as “the ability to meet the needs of the present without compromising the ability for future generations to meet their own needs.” Kube Solutions uses energy from the earth while efficiently using energy during operation so that nothing is wasted or expelled into the environment. Kube Solutions manufacturers heat pumps to make hot and chilled water and, in specialized applications, to make ice in hockey and curling rinks or in the thermal ice storage tanks. The heat pumps are designed for use in integrated systems to provide cooling in one area and to use the heat (produced during the cooling process) in other areas of the building or in an adjacent buildings. If the hot or chilled water can’t be used directly, it’s used to heat or cool thermal mass, so a portion of the heating or cooling energy can be used when it’s needed later. This integrated system can use 60% to 80% less energy than conventional systems. Many federal, provincial, state and municipal governments as well as local utility providers are helping customers make the switch to sustainable building practices by providing rebates and incentives. Check for programs in your jurisdiction, contact your local utility providers and government agencies to find out more.. Check with your local utility providers and government agencies to find out about rebate programs in your area or contact us directly for this information. 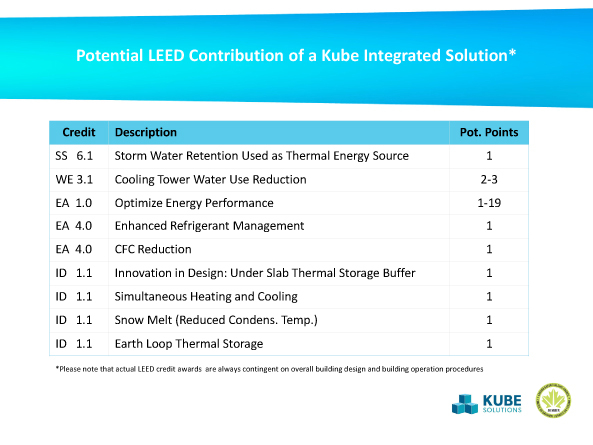 KUBE heat pumps and Integrated Systems can significantly contribute to your LEED goals. Please view attached file for a summary of potential LEED credits.